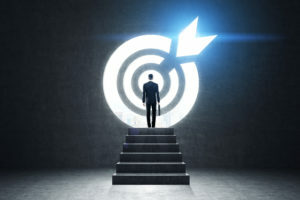 After sales programs aim to perpetuate the life cycle of a customer since retaining customers offer much more benefit than trying to attract new ones. Not only is it cheaper to retain customers but also, offers an opportunity for customers to spend more for products or services they are satisfied in, giving organizations a revenue stream that is more stable, predictable and of course, profitable. Though customer retention provides an upside for businesses, not all Organizations understand the need to retain customers neither know how to implement programs solely dedicated to reducing churn. Only a coordinated and comprehensive effort can reduce churn in a structural manner that would lead to a more sustainable competitive advantage. Most organizations apply churn techniques that only address the symptoms while ignoring the root causes and predominantly tackle the problem only during the defection point of customers, when they are already on the verge of leaving. For companies to reduce churn, they should proactively apply a comprehensive customer retention (CCR) model to address churn in a meaningful, effective, and most importantly, holistic manner. CCR requires that businesses consider the entire customer experience and work to reduce churn not only at the defection point, but also its origin. There are 3 main pillars that act as the foundation of a successful comprehensive customer retention model, with the third pillar being the focal point that would address not just the symptoms, but also their root causes. Inbound retention is all about winning the customers confidence back, thus the resources needed will require exceptional listening skills, an ability to empathize and a willingness to probe, having this opportunity to resell the value proposition of the organization to the customer. For instance, organizations in the telecom industry apply this pillar very well, trying to resell their products and services to customers when they call to terminate their contracts. Given that this pillar is where customers have the last chance to have their minds changed, organizations must focus on preventing customers from reaching this situation in the first place. Retention marketing aims to prevent that customers leave. Organizations apply fidelity or loyalty programs with structured strategies designed to encourage customers to continue to use their services or products. They segment their customer base and apply different loyalty strategies according to the different segments. Customers located in the upper tier (gold, silver) may be given more coverage, additional services or better promotions vs. those located at the lower tier (bronze). Retention marketing strategies also identify customers at-risk of leaving (before they send a cancellation notice) and act accordingly. Segmenting the customer base and having different action plans to intervene prior to the customers decision is vital to be prepared to resolve whatever issues the customer might be facing. Organizations may use different measures and algorithms to target at-risk customers and try to resolve their situation in different manners, commonly known as early warning systems. Most organizations already have these two pillars in place and though they do reduce defections and increase profitability, they still do not address the real underlying causes of churn. 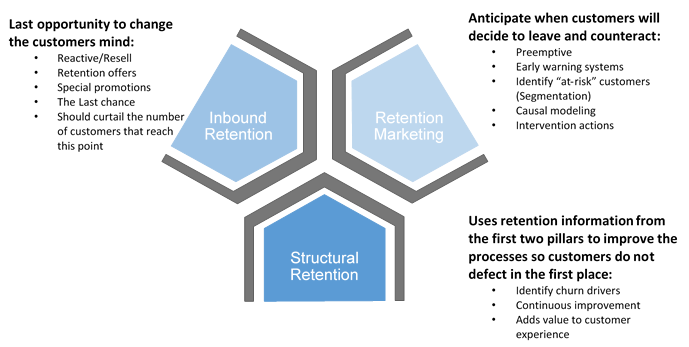 Structural retention uses the information gathered from the first two pillars to proactively change the processes in which the customers interact with the business, addressing the underlying causes of defection and being able to prevent churn even before it manifests. The goal of this pillar is to improve the entire customer experience, through improved services and best in class practices lessening the probability of customers reaching the first two pillars. There are no shortcuts in achieving a CCR model, and it is critical to have each of these pillars in place to truly understand the root causes for customer defection. Organizations must have the buy-in of their employees and must instill the mindset of customer retention within the culture. The Roles and responsibilities, processes, the operating system and the KPIs of the organization must all be aligned with the model and their customers to truly achieve the benefits of higher customer satisfaction, more stable revenue and higher profits.